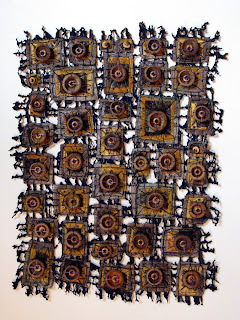 Everything here in Maine at the MacNamara Foundation is wonderful....except that I can't seem to find a place in which to photograph this quilt! I'm not complaining. I'll take the "full view" in November when I can hang it on the gallery wall, light it properly, and enter it into my catalog as a finished work. In the meantime, here are the four quarters. Yes....I put the quilt on the gravel and used the side of a parked truck to brace my camera. 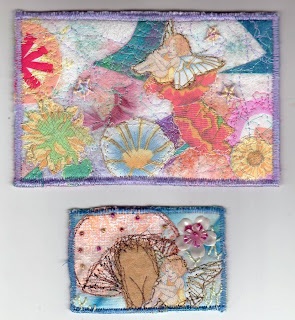 Yet, the images are relatively clear, the colors look fine on my laptop screen, and each image can be clicked upon for a closer inspection of the million or so stitches, including the kantha cloth inspired, off white section between the image of Mamie Smith and the crazy quilting. I didn't do any of the tatting or crochet. 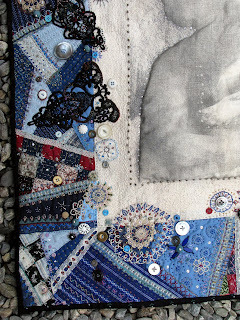 They are vintage scraps of lace. The material includes scraps of old Austrian dirndl skirts and aprons, a batik I found in Thailand in 1987, part of an old hand stitched quilt top, part of in Indian scarf that my sister Sonya and Vipin got me (but I accidentally ripped it on the car door), and a Japanese handkerchief that my son Mathias brought back after dancing in Sapporo. Some of the trim and buttons were left in my Grandmother's treddle sewing machine which I inherited. There are four blue beads that were a gift from Pat Thornhill. Most of the button are vintage. There are some 19th c. jet beads too. 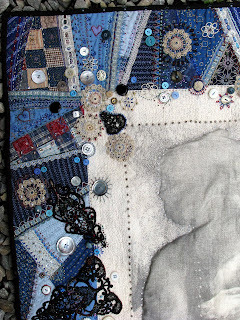 The entire background of the xylene portrait is done in seeding stitch. The portrait itself is stuffed, trapunto style from the reverse. Therefore, the work is very dimensional. Death Wish. 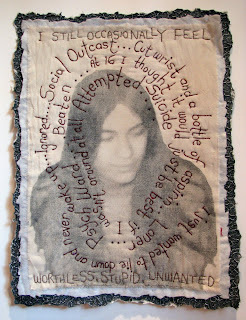 Stitched words: I just wanted to lie down and never wake up...Ignored...Social Outcase...Cut wrist and a bottle of aspirin...Loner...Psych Ward...Beaten...At 16 I thought it would just be best if I wasn't around at all...Attempted Suicide. Unframed: 25 " x 18". A few months ago Arlee Barr emailed me privately (mouse_house@prodigy.net) volunteering for this portrait. I sent her a standard model's release. She signed and returned it. She scanned a photo taken of her when she was sixteen and emailed it as a high resolution image. We also corresponded about this time during her life. I selected and altered several phrases from her message. Of course I shared these with Arlee first. 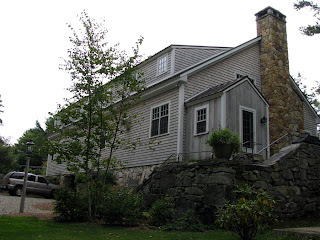 It was wonderful to arrive at the MacNamara Foundation's location on Westport Island in Maine with a familiar series on which to start work. After finishing Blood Donor, I got to work on this piece. Tomorrow I plan to start Marked for Life (Tattoo Artist). Once this piece was finished, I sent an image to Arlee. I wanted her to see it before I posted. At this point, I also asked Arlee whether she wanted me to blog about the work with or without her name. The choice was hers. I'm very pleased with the portrait. I wanted the words to swirl around her head as if visualization of the internal thoughts. The phrase at the top and bottom are therefore couched straight across and in a different shade because it is a current reflection. I tried to post this piece earlier today....but I couldn't manage it. It seems that Hurricane Kyle interfered with the broadband connection. Otherwise the storm was just lots and lots of rain. I miss high speed! On that note....I thank each and every person who has kindly left me a comment but beg for understanding. I really can't navigate quickly to blogs to return the compliments. The support, however, has been my strength here in Maine! Thank you all! I've settled into the routine of working in the new space and in the midst of the other artists. I've created some work, photographed it, and now it's time to share some of the pieces created thus far. Above is the first piece I worked on. 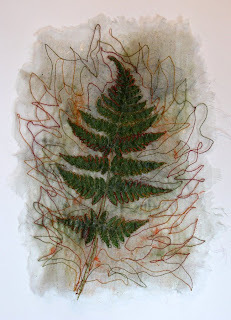 I'd already created the xylene transfer before leaving South Carolina but hadn't put the layers together or even thought about stitching it. Still, this is a piece in my "Decision Portrait Series" and was something with which I was familiar....something perfect on which to begin working in a new setting. I'm honored to know this business man who have donated over 75 pints of blood and often holds blood drives in the parking lot of the Biscuit House, a breakfast restaurant he owns. I shot the photo as he stood in the window for "take away" orders. I've finished Death Wish too but need to email the image to person who submitted the digital data before posting. I brought along a piece of polyester with a heat transferred architectural design on it. This started an experiment....combining my "Elements of Architecture Series" with bonding and melting. I'm very happy with the results. Generally, I hand stitch these pieces heavily, apply a sheer chiffon scarf on top, and free motion stitch. This time, I didn't stitch every little space but added shapes of polyester velvet then added the Wonder Under, foil, scarf, and finally the stitching. Continuing my experimental mode and with interest in the natural surroundings, I made three little studies with plant life. Above and below are two small ferns from the woodlands around the MacNamara Foundation. I sandwiched them between previously painted fragments of Wonder Under and chiffon scarves. A snippet or two of fibers and a few strands of angelina were included on one. I put the sandwich on a piece of water soluble, adhesive coated fabric and free motion embroidered. Each was dissolved in warm water. They are perfectly light, diaphanous, samples. I might build on this idea. 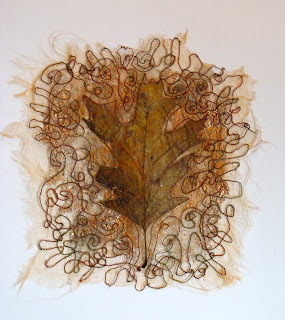 Above is an autumn oak leaf created like the ferns but using some copper foiling too. 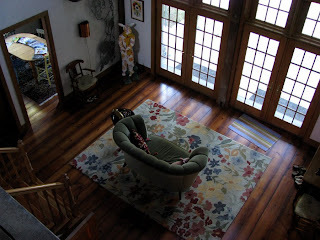 The second piece I created here in Maine was also something with which I am really comfortable. Working in a new setting and among such accomplished artists is more than a bit daunting. Making an "In Box" is sort of like relying on a "security blanket" but I do love making them. I'm planning on creating several small ones too....just because I'll finally have the time to really make smaller works for potential sales. Not everyone needs a big piece and many people have asked if I ever made these in smaller sizes. Now I will. I also challenged myself to use "something" of Maine when creating an "In Box". Above is the result. There are literally MILLIONS of acorn caps here. I think they are SO CUTE. I discovered that they could easily be fashioned into natural beads. After stitching this small work, I collected hundred of acorn caps and spent last evening turning then into a stash for another piece....I haven't decided what sort of piece but time will tell! 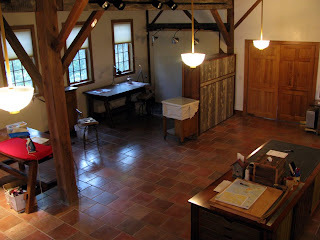 Tour of the MacNamara Foundation's "Barn"
As I mentioned in my last post, the main structure was once a 1860s era barn. Each piece was carefully labeled before it was dismantled....and rebuilt here on Westport Island. The tin tags are still visible on many of the support beams. The entry way is a set of double doors. Off the foyer is an office and the library. The staircase leads to the upper level with four perfect bedrooms. I'm in "The Red Room". 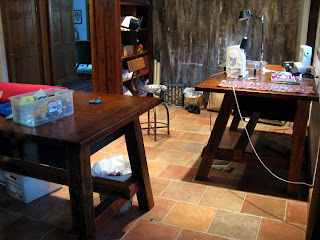 Below is the studio space. 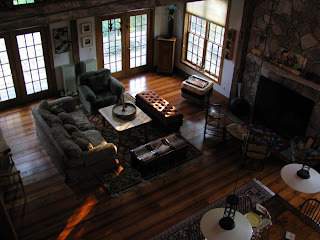 Above is a fabulous sitting area full of beautiful, original artwork. 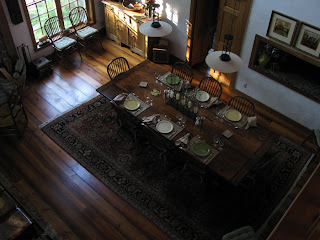 From this vantage point, one can overlook the main sitting area, stone fireplace and the beautiful dining table. The central section of the ground level is the STUDIO. My particular area has natural lighting, two polished, solid wood tables, a shelving unit....and well anything my heart desires. In this area the painter and photographer also have space. There's a ceramic place called "The Camp". I haven't been there yet. 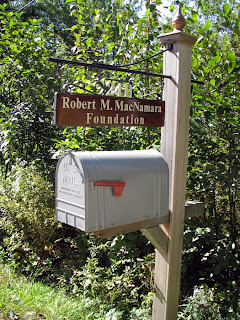 The fiction writer and photographer are staying down the road in another MacNamara building called "Irish House". I've been there. The view is beyond words; the house is beyond ideal. I'll post images another day. If this isn't heaven on earth, there is no such place! 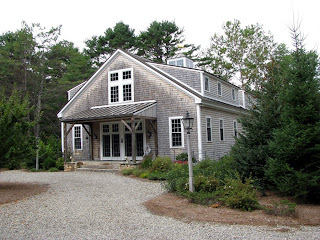 The ground level of the "Barn" here at the MacNamara Foundation on Westport Island in Maine has three distinct areas. The first is a two story entry hall with an open staircase and mammoth chandelier, lots of fabulous original art, an office, bathroom, and library. The far end of the building (or third area) also soars two stories. 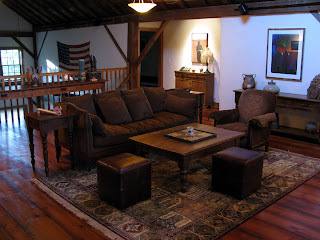 The stone fireplace dominates the combination dining and sitting area. The most fabulously appointed kitchen is visible through an granite topped serving area. I'll post images of these parts of the structure later. 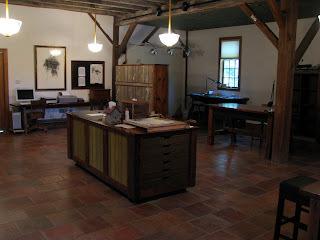 The middle part of the building, however, is the STUDIO. Custom tables and shelves, color correcting illumination, windows to the natural setting, and everything an artist could ever want are but a few inches away. It is simply amazing. In the short time I've been here, I've started and finished two pieces in my "Decision Portrait Series", Blood Donor and Death Wish. 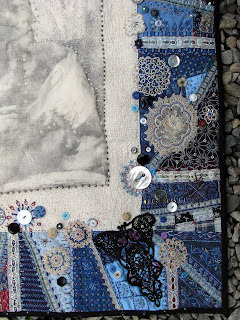 I've also created a new piece in my "In Box" series and started a small experimental work. While I'm away, my husband Steve is learning to blog. I didn't think I'd introduce his blog with this sort of message....but....on Tuesday morning Steve and our neighbor found one of our two beloved pet cats, Siren, dead. He's blogged about it on his new "Mouse House Inc." place. It is here. 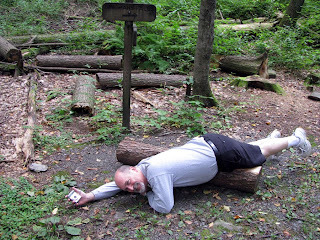 We took goofy photos....like the one below...which I'm calling Dingman falls in Dingman Falls! We spent the second night near the Manchester, NH airport. Steve flew home early the next morning and I drove on into Maine...to the Robert M. MacNamara Foundation on Westport Island. I don't remember a big truck crossing the center lane or some other fatal collision....but my arrival seems very, very much like HEAVEN. There are no words to describe this place. 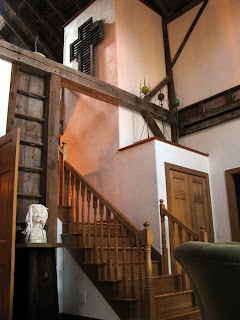 Below: View of "The Barn" from the back. Sure, the architecture alone makes this place special....but it's just the tip of the iceberg. 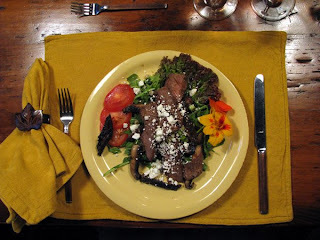 The food is amazing...generally local, organic, perfectly seasoned, beautifully presented, and accompanied by fine wine. I might have to photograph all my meals! All the dishes, eating utensils, serving containers, and table decorations are also....hand crafted! 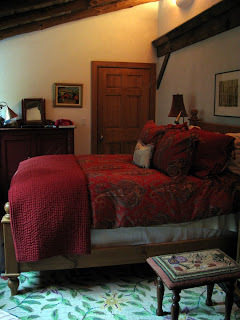 I'll be taking photos soon of the interior...including The Red Room where I'm staying. 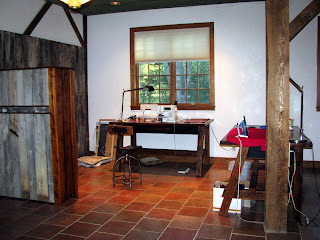 The studio space is beyond my wildest dreams. Every need is provided. In fact, one doesn't even have to ask for equipment and color-correcting lights, additional shelving units or even temporary walls to use as design boards....they are all here. There are four other artists here: a painter, a photographer, a writer, and a ceramist. I'll write about each of them in days to come. For now....we are simply working...creating art....using the uninterrupted time productively. 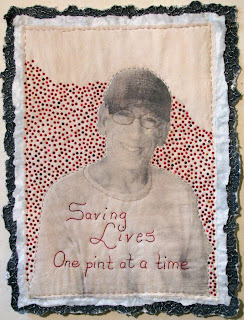 Since Friday, I started and finished a new piece in my Decision Portrait series....Blood Donor. I'll post it tomorrow. I started another In Box piece this afternoon and am planning to work in a sketch book/journal every day too. It's not all "work" either. 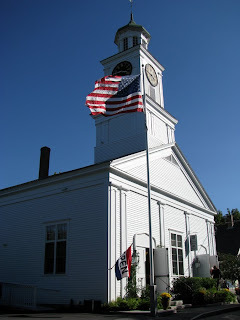 On Saturday we were driven into nearby Wiscasset to the James Patrick Gallery for the opening of "The Ripple Effect". The exhibition featured four contemporary ceramic artists (two of which just finished the summer session at the MacNamara Foundation). They were Robert Shay, Martin Tagseth, Shoji Satake, and Jennifer Allen. 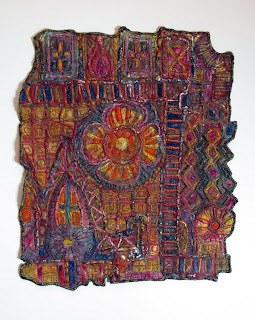 The work was all wonderful, top quality, and surprisingly affordable....but it was the building that fascinated me most. The converted church was perfectly adapted to every gallery need yet retained the feeling of a sacred place. The show was in the "nave" but there was a lower level in which all the artists represented also had work. 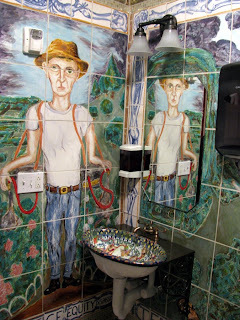 Even going to the bathroom was an artistic experience! 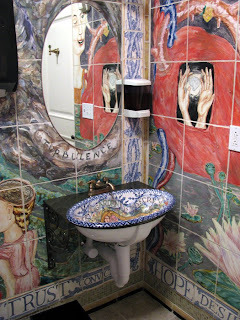 Above: Eve's bathroom. Below Adam's bathroom. Amazing!) More images, more details, and stitching to come! Over a month ago I went to one of the farmer's markets in the greater Columbia area in order to secure this digital image. Selvin and Edwina Harrell were very busy selling their fresh fruits and vegetables in addition to fabulous cut flowers. They own Crooked Cedar Farms in nearby Blythewood, South Carolina. As retired state employees, it is obvious that organic farming is a passion...a committment...a lifetime decision. For me, they exemplify the image of a twenty-first century, family farmer....contemporary and determined, idealistic and far-sighted. I designed the piece with obvious references to Grant Wood's classic 1930 oil painting American Gothic. (Below). Though this classic, iconographic piece is owned by the Chicago Art Institute, I saw it a couple of years ago in Woods' retrospective at the Renwick Gallery in DC. No matter how many dissertations are written about this Iowan couple and their environment....the decision to farm is never questioned. I find this quality in the Harrell's portrait and in their decision to work the land. The past couple of days have been overwhelmingly full. The "to do" list seems to be growing rather than shrinking. There are so many things to finish before I head north to Maine...to the MacNamara Foundation and a six week artist residency. Steve and I have purchased an ISB Modem from Verizon that should (God willing!) allow me to access the Internet while away. This should mean that CYBER FYBER continues rapid plans for its opening in January and trading can still take place. This should mean that I can read and send email. This should also mean that I can share the experience through blog posts. In a few short days....Friday...I'll be there. I'll know then if these plans will work! My fingers and toes are crossed. One of the things I had to finish was my "skateboard". I'm sponsoring another Skate and Create art exhibition at Gallery 80808. It will be odd...since I won't even be there....but my "found art skateboard" is done. Last year's exhibition was highly successful and brought about a lot of awareness and funds for a skate board facility here in Columbia. 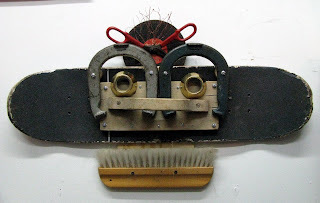 Below is my piece....yes...all of it was "Found Art" except a few nuts and bolts! One of the unfortunate things about being in Maine is that I'll be missing some local art events...including the MOJA juried show opening. I've got two pieces in this exhibition. Also, I've got five pieces headed to an invitational show in Charlotte...and can't attend the opening. If I were in town, I'd be headed to Charleston too....for an underground art auction charity event at Urban Outfitters. The show is called Stix and Stonz...a parody of the child's taunt "Stick and stones will break my bones but names will never hurt me". The show acknowledges the damage that really does take place. Munny dolls are being fashioned into art objects. My friend Ed Madden (who posed for my Decision Portrait called Poet) created the piece below. 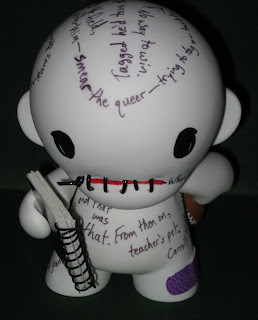 He used words from some of his award winning poetry on both the doll and on the notebook....especially the playground jeer, "Smear the Queer". The underground auction will raise funds for the Reel Grits LGBT Film Festival. I'm totally thrilled, however, that Ed STITCHED the mouth of his doll shut! 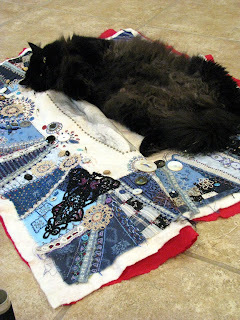 Maybe a little "fiber arts" has influenced him! 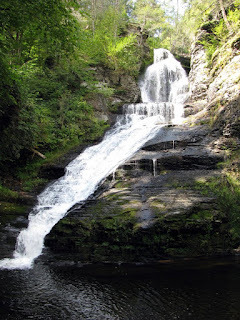 This might be my last post for a day or so....because tomorrow I'm to pack the car for my six weeks in Maine. I haven't even given it much thought....other that "1. Open car door and 2. 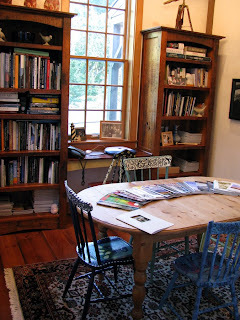 Shove contents of studio inside." 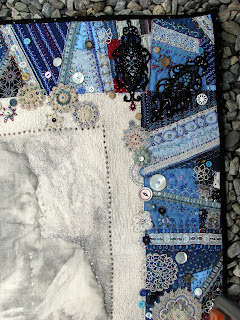 Then....Steve drive and I stitch on Crazy Blues, my crazy quilt, until I arrive in Maine! Last, but far from least, the above postcard and ATC are from Claudia in Australia. Claudia is too young to trade through CYBER FYBER (I imposed an age restriction of 18 in order to avoid any suggestion that I was promoting on-line exchange of personal address and information with minors)....so we traded independently. I'm thrilled with the work...very proud to own such treasures! My husband Steve, however, is totally blown away! 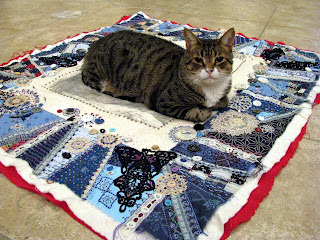 He just thinks it is fantastic that there are young people stitching and trading and making friends over the Internet! Thank you so much Claudia...and also to your wonderful mother Jo-Anne! Hi! I'm Jan Hodgman. My "official" qualifications include ordination as a Soto Zen priest, an undergraduate degree in Psychology, a Master's in East Asian Studies, with studies in Zen Buddhism to augment my eight monastic years in Japan, certification as a Focusing Trainer by Reva Bernstein, and a unit of Clinical Pastoral Education, serving as a hospital chaplain. More importantly, though, I really love being a part of a person's journey toward self-awareness and a full life. Jan and I worked via emails to achieve this portrait. The small image is her ordination day. I knew I wanted to use it...but didn't know how to best tie the two images together. I thought about enclosing the small picture in a heart shaped form. I wrote to Jan. Wisely, Jan suggested an Ensō circle. As soon as I understood the significance and saw the circle, I knew this was the solution. The Ensō circle is one of the most common symbols in Japanese calligraphy. It is associated with enlightenment, elegance, strength, the universe, and the "void". Sometimes it is a full circle; sometimes there is a slight opening. It is a sacred in Zen Buddhism. But, it is generally created in ink....something painted, fluid, wet. I mixed Golden acrylics micaceous iron oxide with clear tar gel. A ceramic bowl was placed upside down on a sheet of silicone coated paper (baking parchment would do!). I poured the solution down and round the sides of the bowl...allowing it to ooze onto the paper...and then pulled the bowl away. This left a circle of paint. It dried. The next day I peeled the "skin" away from the paper. Because of the mica in the paint, it reflects light...retaining a "wet" look. I made two....used the one on the right. Now...to attach the "skin" of acrylic paint! I traced the "skin" onto heavy watercolor paper and cut it INSIDE THE LINES....smaller than the edge of the "skin". 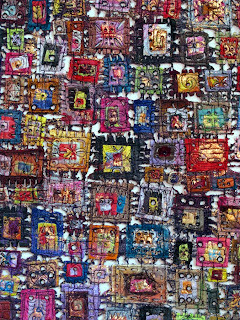 This was stitched to the piece (above....click to enlarge). The last thing I did was to carefully apply heavy gel medium to the watercolor paper and position the "skin". The heavy gel medium adhered the acrylic to the watercolor paper when it dried. Ta-da! An Ensō circle....looking like a brush stroke of wet paint on top of the fabric! 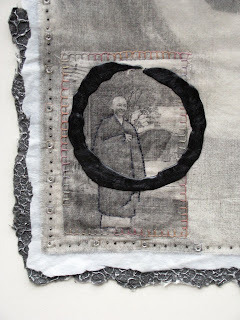 Also....I used last week's TAST (Take a Stitch Tuesday) "stitch of the week"...the up and down buttonhole surrounds the ordination day photo....with a break....like the slight opening in the Ensō circle. After all is said and done, I, too, feel at least a little ENLIGHTENED! 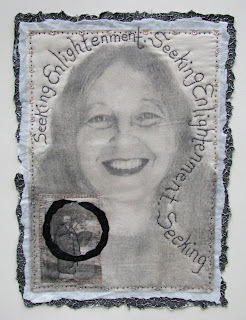 I had hoped to "unveil" Buddhist from my Decision Portrait series. It is finished, mounted, and photographed. 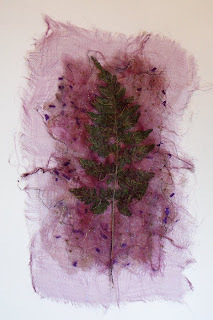 Yet, I'm waiting to hear from the wonderful fiber artist who provided her image. She's on a camping trip. With her permission, I'll provide her name and website information along with the completed work. 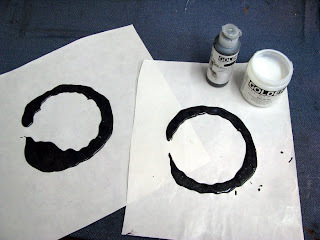 I also documented the unique process I used to create a zen Ensō circle that really does look like "wet" painted calligraphy. 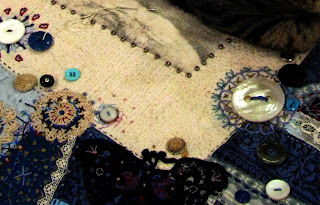 In the meantime, I've been busy stitching on Crazy Blues. My other cat, Siren, couldn't be left out of the process....or he simply has to sit wherever Shadow (the other cat) has been. I think the cats are helping with a future, grand "unveiling" by hiding part of the work now! This piece is going to take longer than anticipated. 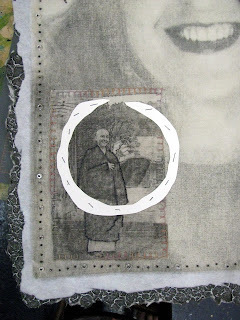 In love with the Indian kantha clothes that Dorothy Tucker showed during a lecture at the Swedish embroidery symposium, I started running stitch all around the xylene transferred portrait of Mamie Smith. It looks and feels like the kantha clothes. I love the results. 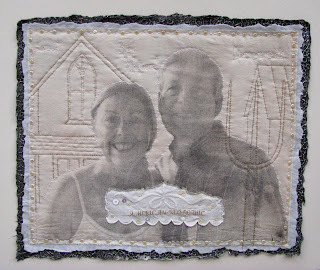 Yet, this has lead to some other "issues" that will require even more embroidery. Now I know what I'll be doing on the ride to Maine next weekend! I haven't started packing....probably won't until Wednesday morning (we leave Wednesday afternoon)....but I'm not worried now that I know what stitching I'll be doing on the way there! I LOVED THIS STITCH! I've even used it already on new work! (It's coming tomorrow!) This is the Up and Down Buttonhole Stitch. Next week is couching....hmmm...one of my all time favorites! Yipee! 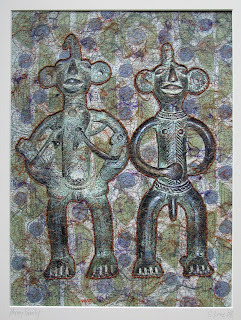 I've finished another piece in my African Series. This is Happy Family. I know I just did a piece with this same title....but one's in my Decision Portrait series and this one is in the African Series. 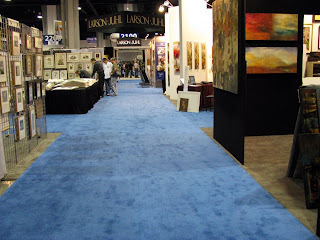 This weekend Steve and I headed to Atlanta for the annual art and framing trade show. We've attended most of them since about 1989. The first one was like "Pandora's Box". When I started Mouse House (1987), I had never even been in another frame shop. The only supplier I knew was the local place in Columbia. That first show opened the world. During the '90s the trade show grew and grew. It took all day to simply walk up and down the crowded aisles. Generally, we spent the night and made purchases on the second day. 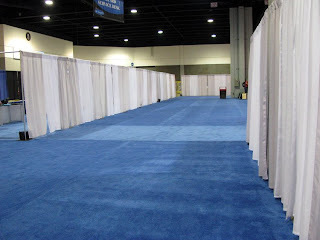 With the down turn in the economy, however, the trade show has dwindled away to a leisure 45 minute stroll. Many "anchor" suppliers didn't set up. There was little new to see. Once the total floor place was crammed with vendors. 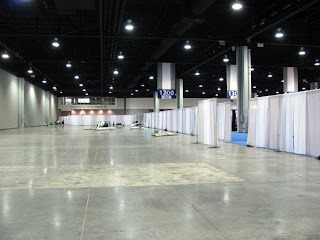 Now, the both ends of the Georgia Convention Center were bare. Some of the aisles were empty; many booths were vacant. There was no crowd. One salesperson said it resembled a bowling alley. I didn't downsize Mouse House because of the economy. My business was growing at an alarming rate. I finally admitted that I wanted to be an artist. It took two years to forcibly downsize....I'm glad I did. While the state of the art and framing industry doesn't really affect me now, it was still a little sad to see this trade show.